From the team that assembled the blockbuster The Lego® Movie, comes Lego Batman in his own hilarious and fun big-screen adventure! There are big changes brewing in Gotham and if he wants to save the city from The Joker’s hostile takeover, Batman may have to drop his lone vigilante façade, learn to work with others and lighten up. 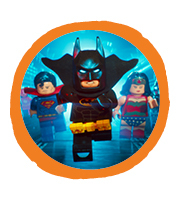 Purchase a ticket and join us for a Lego® play session before (11am – 11:30am) and after (1:15pm – 3pm) the film! An electronic maze of fantasists, meme culture, 4chan, the alt-right and ISIS, exploring the smoke and mirrors world of online extremism, anonymity and hate speech. A selection of the Australia’s finest jazz/rock musicians come together with Vince Jones will perform and pay homage to Van Morrison's acclaimed albums, Astral Weeks and Moondance.